The Reading Royals of the ECHL, an affiliate of the NHL's Philadelphia Flyers has announced the signing of former Quinnipiac forward K.J. Tiefenwerth to a standard players contract. Tiefenwerth played 127 games in three seasons for the Bobcats after transferring from UMass Amherst after his freshman season. He finished his Quinnipiac career with 10 goals and 33 assists along with being a plus 9. His transfer to Quinnipiac likely saved his life after a physical discovered a heart defect which led to open heart surgery in the summer of 2013. 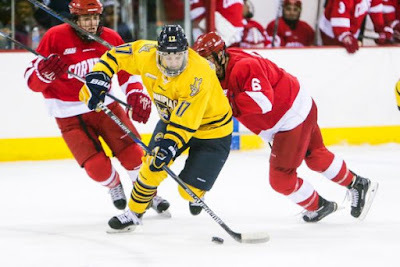 He made the ECAC All-Academic Team four times and was a key member of the 2016 Quinnipiac team that reached the Frozen Four before falling to North Dakota in the National Championship game. He finished his collegiate career with 49 points (12 goals and 37 assists) in 137 games played between UMass and Quinnipiac. Congratulations to K.J. on signing his first professional contract.